Edgeline Landscape borders are unique landscape borders created on-site by extruding colored concrete through a mold. Once extruded, the concrete is dusted, stamped and sealed. Years down the road they look just as beautiful as the day they were installed. Reduces edging & trimming with a low-profile mower edge on the lawn side. This edge is designed to be lower than the mower blade greatly reducing or even eliminating the need to edge the bed. Holds mulch in place with a 4-inch raised edge on the bed side. Your borders will provide many years of aesthetic and functional enjoyment. Most jobs are completed in one or two days, transforming your landscape overnight. Edgeline Landscape Borders provides a 12 month unconditional guarantee against defects in workmanship. Reduces edging & trimming with a low-profile mower edge on the lawn side. Successful root deterrent between beds and lawn. 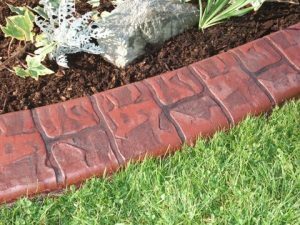 Permanently affixed and will not rust like steel, decompose like wood, break like plastic, degrade like pavers or move like brick. Our concrete is mixed with polymers, fiber and additives and is extruded with steel cable inside for great durability. Professional appearance adds value, elegance and sensational curb appeal to your property. 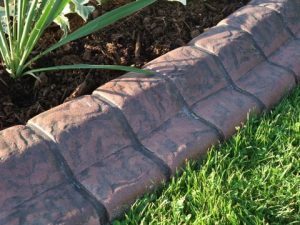 Add beauty, style and functionality to your landscape with custom concrete borders from Edgeline Landscape Borders. Create graceful curves around your beds or line the edges of your walkways or driveway. Add edge lighting for an ambient glow in your flower beds. 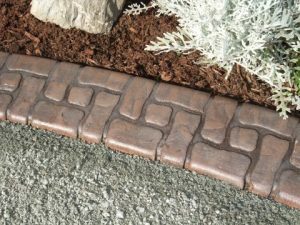 We make a wide assortment of patterns and colors from brick to river rock or most anything you can imagine. Ready to find out more about Edgeline Landscape Borders?